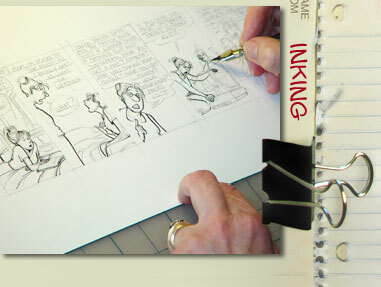 Following her own loosely penciled line, Lynn shapes the Patterson characters with india ink and the C-6 Speedball split-nib pen. The touch of pen to paper is like touching the actual characters. Pressure on the pen parallels the pressure one might use to carve and shape a 3-D object. In this way, hair and body lines flow with lines that widen and minimize, giving more movement, more "life" to the characters. This cannot be done with conventional markers. Ink is also permanent; many markers fade.